W E L C O M E S Y O U T O 2 0 1 6 ! The product of years of diligent research, design and copy writing, this fan project has finally come to fruition and fulfilled its original brief – to plug a big hole in Superman collectable history. 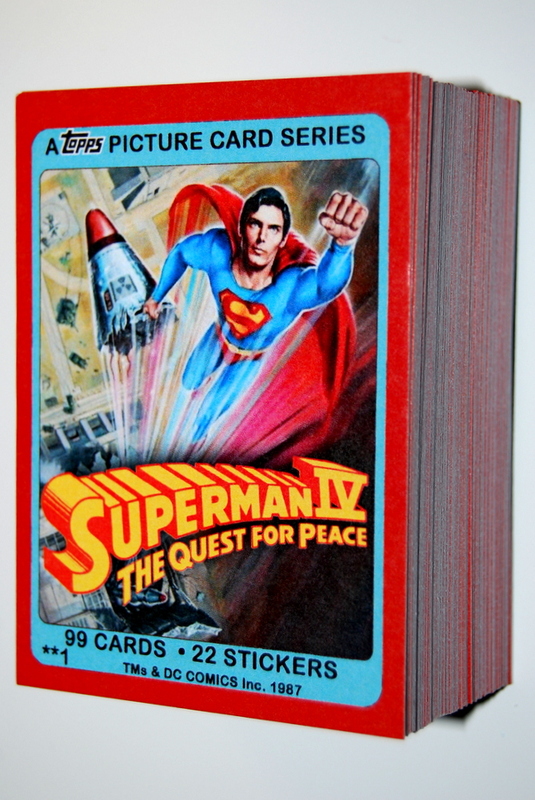 Never officially produced for reasons still unknown, this Topps style Superman IV: The Quest For Peace Movie Picture Card series has been created from scratch using rare images compiled from the SUPERMANIA, Capedwonder.com and A Tribute To Christopher Reeve‘s joint collections to fill the void and illustrate the story of the longest, uncut version of the film as originally intended over 99 cards. Considerable effort was made to give this set as authentically vintage appearance as possible to compliment the prior collections in the series perfectly and be indistinguishable in presentation and quality from any official release from the era (second pic) from the traditional title card (top pic) to the accompanying story breakdown on the reverse (incorporating all deleted scenes). 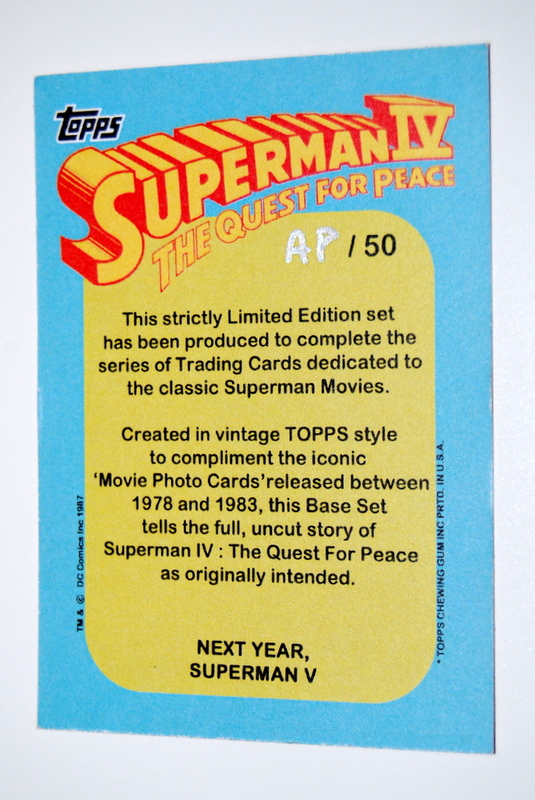 This full base set (Note: Stickers will be a future project) concludes with a special hand-numbered preview card (note; ‘AP’ Artists Proof) of the unmade feature Superman V (third pic, for fun as if the movie series were to continue) for this strictly-limited run of 50 sets (to tie in with Superman’s 50th anniversary at the time). this are awesome! great idea to have the Superman V card. the image taken from a little seen before promo pic of Reeve in Superman IV is inspired! that could’ve easily been an early pic from a potential Cannon Superman V (pretty sure magazines of yesteryear would do that – coming soon type articles therd choose a very rare little seen before photo from a movie to show when talking about the forthcoming movie in the series that hadn’t been made yet/was only greenlit so youd be like ‘uh? is that a pic from the next movie already?!’). Looking forward to get more infos 🙂 Thanks !!! This set looks Great! Definitely Interested. I would pay anything for this set!!! Want to buy!!!! Sorry I never left my email, Stevelashway@yahoo.com. Thanks. 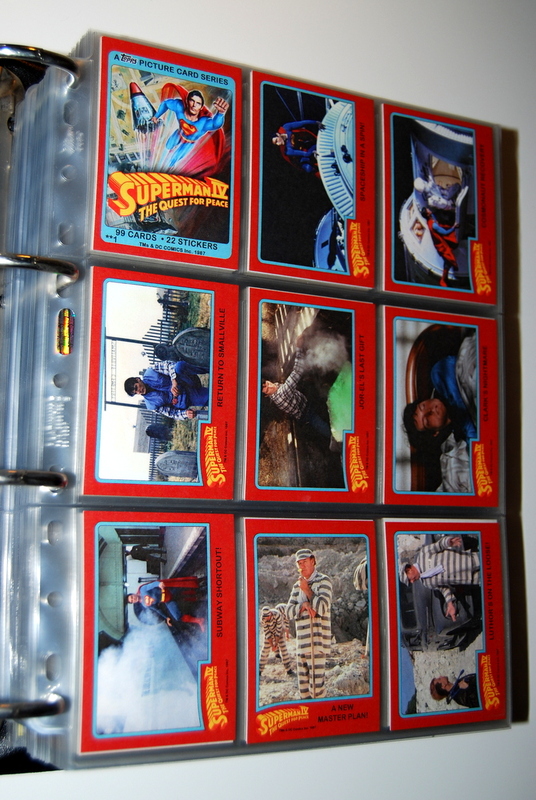 I am interested in having a copy of those Superman IV movie cards as well! Please Let me know when they’re available! 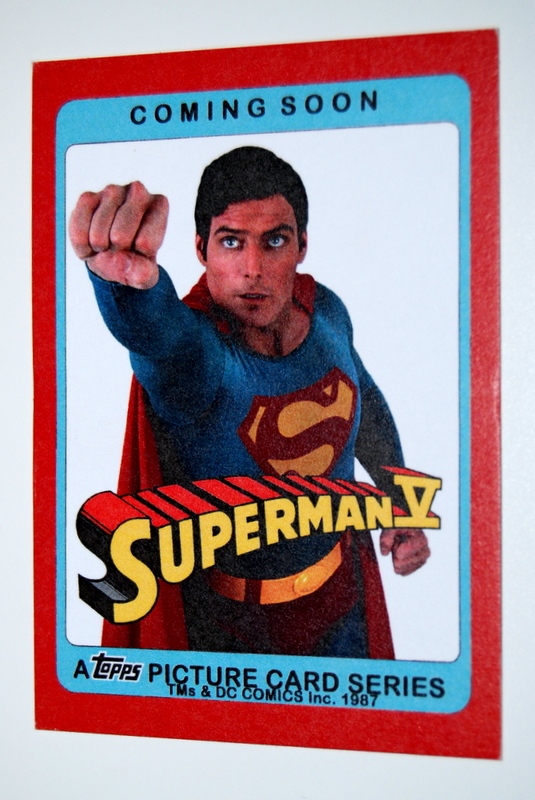 My e-mail address is igable@yahoo.ca and I would really love to have a set of those Superman IV cards too! Hi, are these available still? Amazing work. Now I want to collect the sets from the other films!